The Swedish American Line was the first shipping company that established direct regular passenger and mail traffic between Sweden and the United States. Nine ships operated between 1915 and 1975. Sea Post Offices were not opened until 1928, when "SJP 7" cancellations were used in each of three ships, the Kungsholm, Drottningholm and Gripsholm. 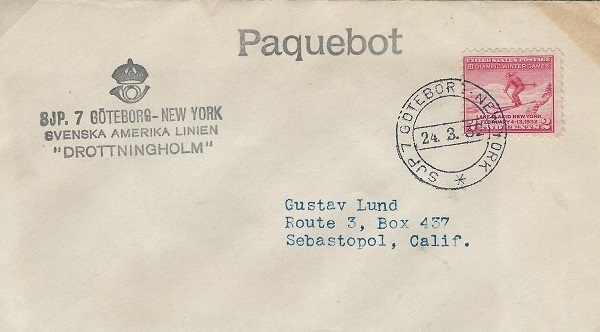 PAQUEBOT hand stamps were used in conjunction with letters mailed with US (or other non-Swedish) stamps and 'T' stamps applied to indicate postage due. Registered mail could be sent from these ships with registration labels naming the particular one. The Sea Post Offices closed in 1952, after which the crew used 'POSTED ON BOARD' cachets. 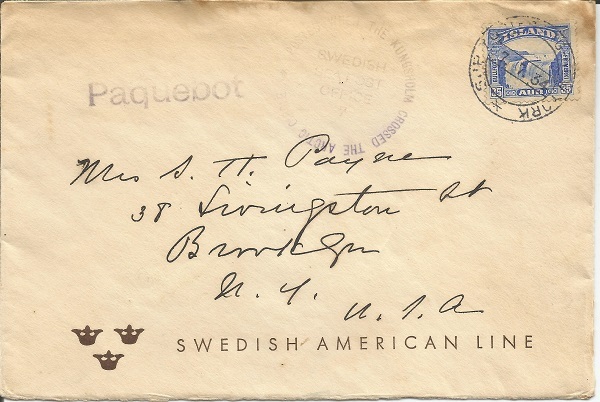 Cover clearly showing the “SJP.7 Goteborg – New York” cancellation on a 2¢ US stamp. Posted on board the DROTNINGHOLM. 1934 cancel “SJP.7 Goteborg – New York” over a stamp of Iceland. An article illustrating many of the marks used by the Swedish Amerika Line together with a history of the ships involved may be downloaded here: SWEDISH AMERIKA LINE By Mike Dovey. Swedish American Line Postal Service from 1915 to 1975, John Perry, TPO Journal Vol. 65, Page 75, 2011.